Anodized aluminum plate, dimensions 10.75 in. x 8 in. 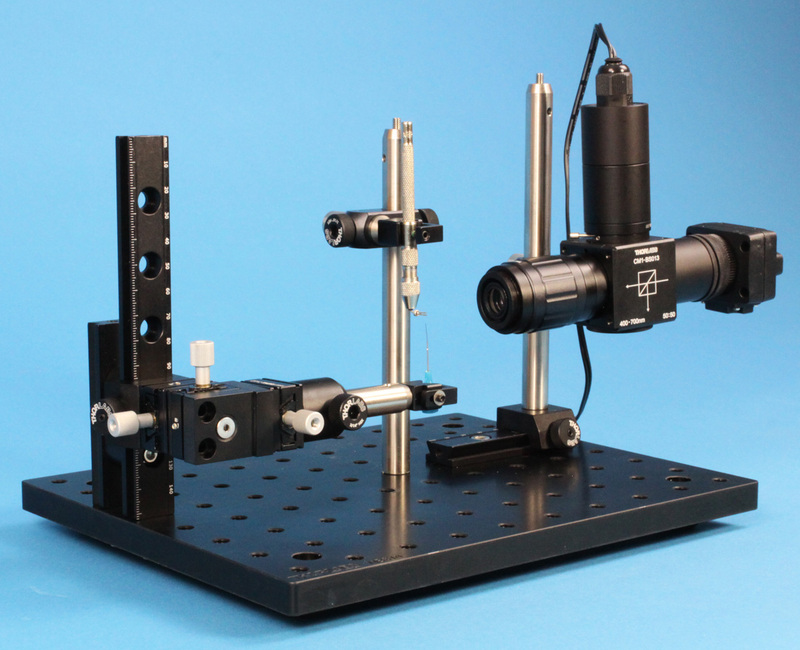 x 0.5 in, compatible with Mad City Labs manual and motorized micropositioning XY stages for SPM as well as the SPM-MZ. Additional 1/4-20 tapped holes on 1 inch spacing for accessories. Exterior dimensions approximately 20 in. high, 17 in. wide, and 19 in. deep. Interior dimensions approximately 15 in. high, 12 in. wide, and 10.5 in. deep. Glass door and double insulation for thermal isolation. Door has recessed handle and is reversible. Suitable for visualizing approach of SPM probe to sample surface. Microscope output to USB2.0. Manual XYZ positioning capability included. Video screen not included. Adjustable output, white LED illumination for use with the Video Optical Microscope. The Mad City Labs SPM etch kit is designed allow users to create a sharp tungsten tip suitable for scanning probe microscopy. The instrumentation allows the user to attach a tungsten wire to a quartz tuning fork and electrochemically etch the wire. The attachment of the wire is done with the assistance of a three axis manual micropositioner and video optical microscope. The etching process uses the lamella method where the wire passes through a thin lamella and into a bath of potassium hydroxide(KOH) or sodium hydroxide (NaOH). A bias voltage is applied to the electrodes in the film and bath which causes the tungsten wire to be etched by the film. When the wire is completely etched, the bottom portion of the wire falls, the etching process is complete, and the remaining top portion of the wire is left with a very sharp tip. Rails, stainless steel posts, 3 axis manipulator. Nanopositioner-ready, stepper motor driven, micropositioning systems with 1, 2, or 3 axes for high precision positioning for a variety of applications. Position noise of a nanopositioning system is the ultimate limit of the system's measurement resolution. Many applications involving sub-nanometer measurements, such as atomic force microscopy (AFM), would not be possible without low noise nanopositioning systems. Some companies claim to sell systems with sub-nanometer resolution, but they do not have data from external metrology tests to support their claims. All Mad City Labs nanopositioning products are rigorously tested before shipment. These tests involve a series of measurements designed to fully characterize the performance of the nanopositioning system with a realistic environment and testing conditions that match the application. Available metrology tools include NIST-traceable interferometers, high resolution AFM, and a high resolution position noise analyzer, designed specifically for nanopositioning characterization. The links below lead to in-depth descriptions of some of our AFM measurements. 312 pm Si (111) atomic steps detected using a nanopositioner with PicoQ® sensor technology, measured by AFM. Measurements taken with an AFM show that nanopositioners with PicoQ® sensor technology have sufficiently low position noise to accurately resolve single atomic layer size steps, 312 pm. 100 and 450 micron range nanopositioners with PicoQ® sensor technology perform 860 picometer steps, 1 nanometer sine wave, and repeated 95 picometer steps, externally measured by AFM. AFM is used to externally verify that the position noise of a nanopositioning system with PicoQ® sensor technology is less than the surface roughness of a Si (111) sample, 60 pm RMS.